Thanks to the support of folks like you, this child now has greater vision…literally! Orphan Voice strives to provide everything for the children in our full-time care that you would provide for your own children. And because you care, we can! 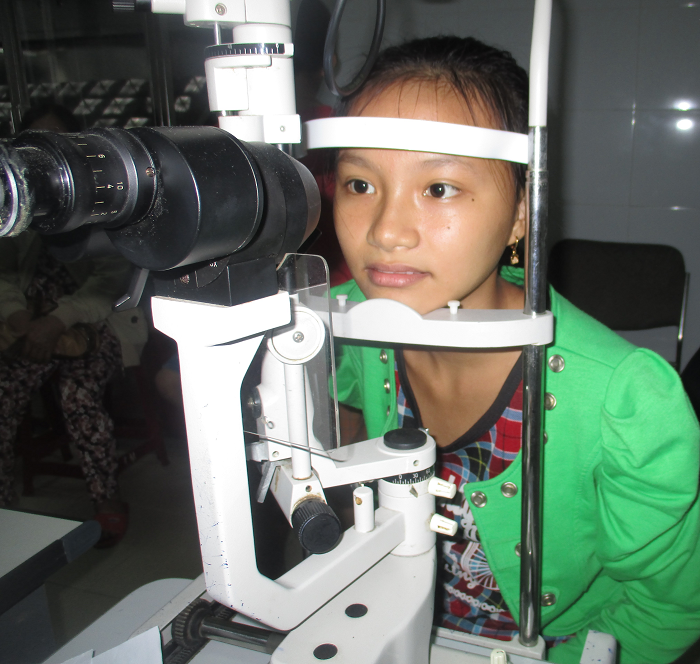 Recently, we took the Promise House students to Danang Eye Hospital for examinations. Seven of the 19 children needed glasses…and got them! Three of them also needed medicine, which we gladly purchased. We are school-ready on the sight side anyway! Your support of Orphan Care helps us truly take care of these, our precious children. Seven Beauties Sport New Glasses! To sponsor a Promise House child or support Orphan Care, please Donate Here. Or mail your gift to Orphan Voice, P.O. Box 910410, Lexington, Kentucky 40591. It starts in a week! October 4-6, brave men and women in Vietnam will set out to run the entire width of the country in just 3 days. Craig Reed started the challenge last year, and this year he will be surrounded by relay teams and at-home supporters running along with him. At least one other person is running the full 100-mile ultra-marathon. The question is: How far will YOU go? You can give to Enduring Voices in general, or type the name of a runner or simul-runner in the Search to support specific people. (Ex. Tony) And don’t forget to PRAY for them! Read the Runners Brief BELOW, written by Craig, to see what they will encounter. It won’t be easy. But the cause has eternal significance. 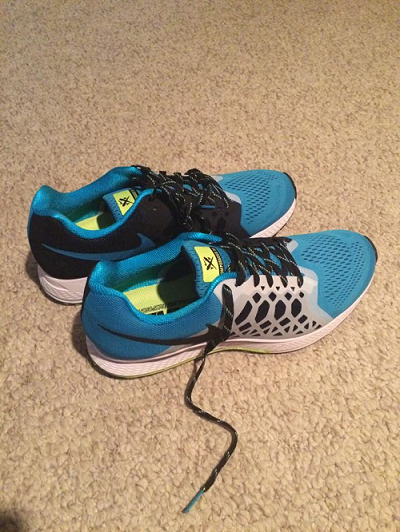 From Tony: I’m hoping you’ll step in to support me in my run. I’m a “gray hair,” but I’m doing my part! Please consider giving a significant gift, if you are able. THANK YOU SO MUCH! Kenneth Etta came to Vietnam to help us fight trafficking through education. 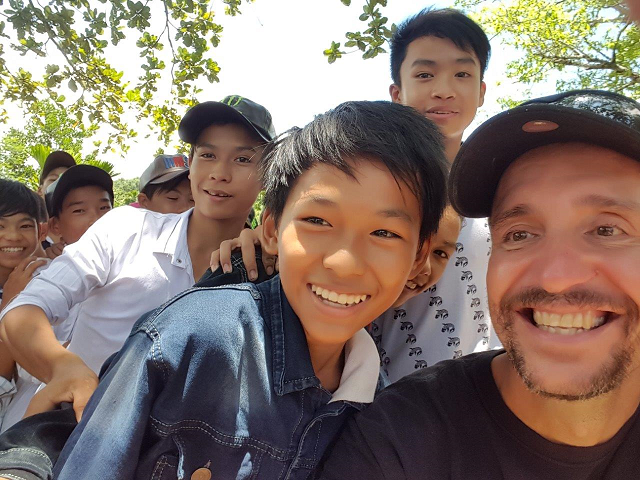 In September, he took part in our More Precious Than Gold seminars, teaching over 4500 students how to protect themselves from traffickers. 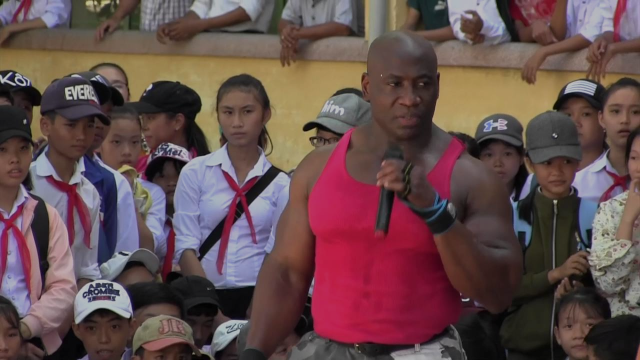 The children were mesmerized by his feats of strength, and his strong message of truth. Click the picture below for a peek at what they experienced. And please support Trafficking Rescue and Prevention. It’s WORKING! On Monday, we were introduced to the Orphan Voice Team and enjoyed a devotion time with them. We spent the day preparing 500 pairs of shoes for delivery in rural areas. On Tuesday, we got to experience Promise House…moving furniture and…crafts with the children. We were touched by their immediate acceptance of us. done there… We were amazed at how much of an impact the Center has had on children and families, and wondered how much more could be done with improved equipment and additional training. In the afternoon, we went to New Beginnings School for the Deaf and applied a fresh coat of paint to the front of the building. On Thursday, we got to deliver the shoes. This was the highlight of the trip, seeing the smiles on the kids’ faces as they received their shoes… It was humbling to realize that what we take for granted (shoes) is truly a blessing to them. 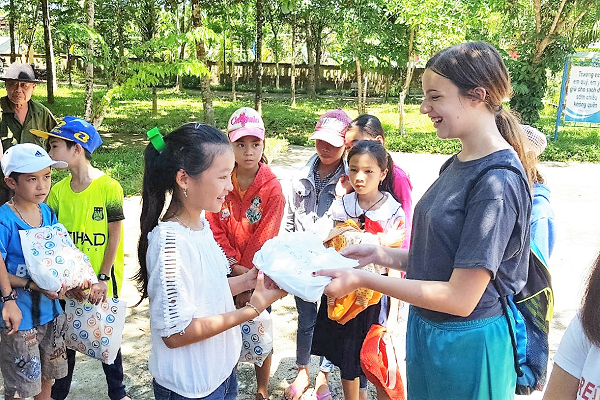 Overall, we were amazed at the scope of the impact that Orphan Voice has, reaching children through orphan care, and helping those with special needs. We were amazed at how Orphan Voice does not shy away when they see a need, but immediately go to work to meet it. And we were also amazed at how easy it is to be a part of meeting that need, whether through providing funds or through our presence. And how “being there” is invaluable…to experience the need first hand and show them our love. Giving from afar is one thing, and important. But being there puts it all in perspective. 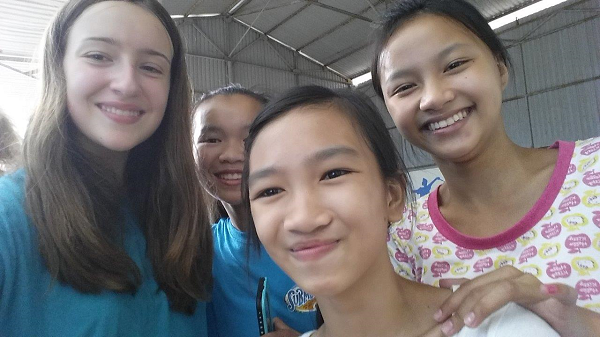 To visit Orphan Voice on a Friendship Team, email maria.lester@orphanvoice.org. Thai is 10 years old and has been deaf and unable to speak since birth. Because there were no schools to teach him, Thai’s development was grossly stunted. He couldn’t understand what others said, and he didn’t know how to express his thoughts. That is, until the New Beginnings School for the Deaf was opened. As the name conveys, this school was Thai’s new beginning. After one year of study in sign language, his world is completely different. He can now communicate with others, both deaf and hearing, and he understands people, problems and relationships better. He is also more confident and closer with others. Thai is improving every day, studying math, language, science, nature and society. He is learning that the most important thing is to become a person of good character. 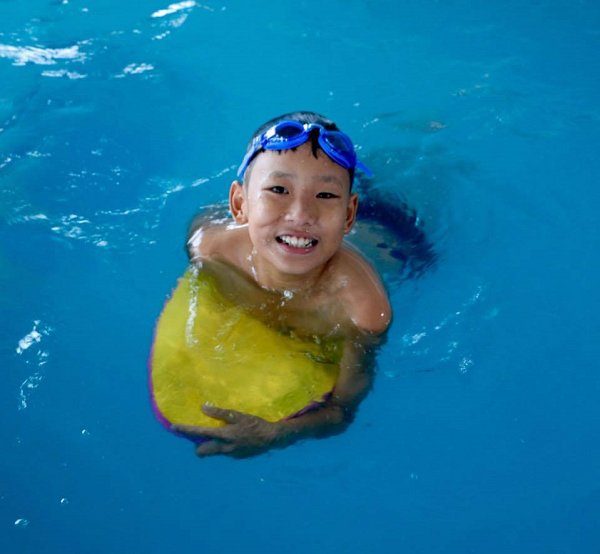 To ensure New Beginnings School for the Deaf continues for Thai and others, please support Special Needs programs HERE. Or mail your gift to Orphan Voice, PO Box 910410, Lexington, KY 40591. It’s difficult to leave your home at age 10. “Matthew” came to us in September, and recently celebrated his 11th birthday here. He is grateful to be at Promise House, but sometimes it’s hard to understand. Matthew has two younger sisters and one baby brother. 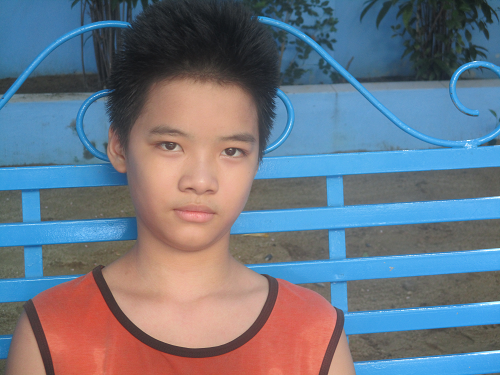 His mother, Trang is a street vendor who sells washing tools. Her income is very low and unstable. There is no support from the children’s father. Matthew has never known him. The family lives in a government apartment, but Trang has been unable to pay the rent for over a year. A friend told her about Promise House. Desperate, she came to us for help. We welcomed Matthew with open arms. Matthew is a cute and friendly boy. He makes friends easily and enjoys living at Promise House with his new pals. He likes football, basketball and badminton. Would you like to sponsor “Matthew?” Or another Promise House child? With your commitment of $40 per month, you can learn Matthew’s real name, receive his full story, and send him letters of encouragement. Our Child Sponsors mean SO MUCH to us. If you are not sponsoring a child, please prayerfully consider the difference it makes. To sponsor a child, or support Orphan Care in general, please donate HERE. We are looking for a nutritionist who will volunteer to look at the diet of the Promise House children and advise us on nutritional adequacy and caloric sufficiency. Please contact Maria Lester at 866-377-4928 or maria.lester@orphanvoice.org. Thank you! Personal Energy Transportation Carts make a world of difference to those who need them. Meet Ca. Ca is 12 years old. He lives in Peace Village. He cannot walk because his legs are weak. 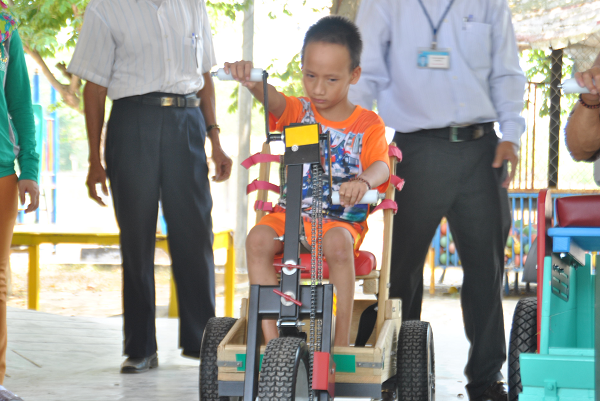 The PET Cart allows him to go to school on his own. The school is a little less than 1 kilometer away from the village. For Ca, P-E-T spells Education! To help someone who needs it receive a PET Cart, donate to Special Needs HERE.